A carrot-top garden can be grown any time of year, even if there's snow on the ground and gardening season is months away. Although the plants won't last long and the carrots can't be eaten, growing carrots from carrot tops is inexpensive and fun for any age. All you need is a few carrots, a dish and a green thumb. Choose a few large, healthy carrots that still have greenery at the top. Cut the carrots with a sharp knife, leaving only about an inch at the top, thicker end. Trim the greenery down very close to the carrot. Fill a shallow bowl or a pie pan with sand or tiny pebbles. Plant the carrot, pushing the cut end slightly into the sand or pebbles. Pour lukewarm water into the bowl or pie pan so the sand and pebbles are very wet and the carrot is sitting in the water. Add fresh water as needed, and don’t allow the carrots to dry out. Put the carrot tops in a sunny place. Lacy, green growth should soon emerge from the top. When the carrots grow too big for the container, throw them out and start a new carrot-top garden. Most types of carrot take about 3 months to fully grow. Carrots may be harvested earlier, though, for smaller, more tender varieties. Choose a plump, fresh carrot. The carrot must contain the top. Those that have been trimmed, or baby carrots, will not grow. Cut a 2-inch section off the top of the carrot. Fill a small saucer or tray with a 1-inch layer of pebbles. Place the cut end of the carrot in the saucer and fill in around the carrot with pebbles to hold it in place, leaving 1 inch of the carrot above the pebbles. Space carrots 2 inches apart, if growing more than one carrot top in a container. Cover the pebbles with water. Check daily and keep the water level even with the top of the pebbles. Place in a sunny location and watch for new growth to appear from the top of the carrot. Pull the carrots from the soil gently by grasping the greens and pulling straight up. If the soil will not release the carrots easily, loosen the soil around the carrots with the hand rake and then pull the carrots. Place the carrots into the colander and wash them thoroughly under cool water to remove all soil and dirt. Wash the carrot greens also if you intend to eat them. Use a kitchen shears to cut the carrot greens from the carrots just above the tops of the carrots. Place the carrots into a perforated produce bag. Seal the bag. Place the carrot greens into a separate perforated produce bag. Seal the bag. Store both the carrots and the carrot greens in the produce drawer of the refrigerator. Keep the carrots for up to three weeks in the refrigerator and keep the carrot greens for approximately three days. Wait until the roots are a minimum of three-quarters of an inch in diameter to harvest carrots. You can harvest finger carrots, a variety of baby carrots, when their roots are a half-inch in diameter. Maturing to these widths takes approximately 50 to 75 days depending on variety. Baby carrots are ready for harvest in about 50 or 60 days, while Danvers carrots are ready for harvest in 75 days. Pull the carrots out of the ground carefully with your hand. Grab the carrot as close to the ground as possible. If the carrots are not strong enough to be pulled out without breaking, use a trowel to dig them out. Keep pulling carrots through the harvest season, generally three to four weeks. You can harvest carrots that you planted late in the season, until well after the first frost if you prepare the ground. Place some hay or straw mulch over the ground to keep the ground from freezing, and the carrots will be fine until the ground freezes solid. Choose firm, young carrots that are well-formed and free of blemishes. Do not store carrots that are cracked or wilted. Remember, the deeper the color, the greater the quantity of vitamin A. Remove the tops, and then wash the carrots under warm water. Wash them only if they will be stored in the refrigerator or freezer. Taking the tops off prior to storing is important because if left intact, it will foster shriveling. Be careful, too, to remove any root hairs or leaves. Store fresh carrots in an unheated attic or root cellar. Choose a dark, cool spot for the carrots. 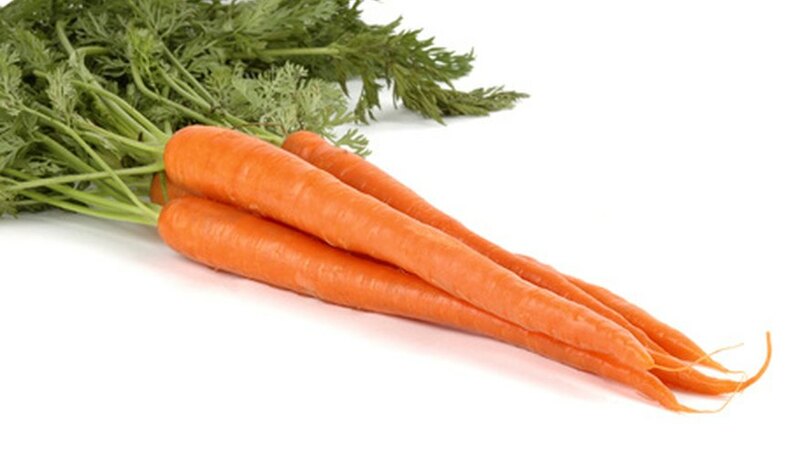 Keep carrots sweet by storing them away from apples which give off ethylene gas and cause carrots to become bitter. Carrots will store this way for about 3 months. Freeze clean carrots by placing them in a plastic bag. They will store in the freezer for about 6 months. Refrigerate cleaned carrots by placing them in a plastic bag. Carrots will keep in the refrigerator for up to 4 weeks. The best time to harvest carrots is when they are between ¾ and 1 ½ inch in diameter--approximately 70 to 80 days after planting.